After my most romantic Junior year in high school, let us now proceed to my last year in college, my Senior or fourth year high school year! If in my third year, love and career collided, this year it was more for career! The competition for the honor graduating students really intensified! The battle between the top 10 students were really seen! But it was not all! Besides being a First Honorable graduate, I was also crowned as the Best in Social Studies and the "Mamamahayag Ng Taon"! 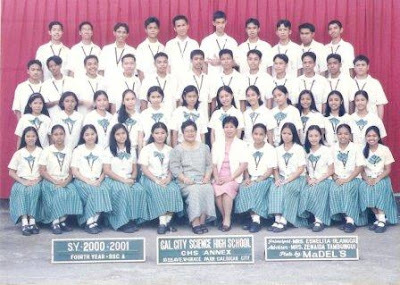 What more, my fourth year high school days were really a successful one! I participated in the different seminars and trainings, I won in the different Quiz Bees (in Science, World History, Pop Quiz, etc.)! And I was also the topnotcher in our NSAT exam! Great! The blessings did not stopped here. Before I enter college, I got my DOST scholarship! Thank you Lord! Well, these were my four class pictures in high school! Do you see how my physical appearance developed in these four pictures? !